Putting up a G5RV. Part 1. I was trying to figure out how to get the G5RV antenna that I bought last weekend at the hamfest (HamEx) up and get on the air with more copper in the air than the current setup (a hustler vertical) allows me, so I've gotten the following "antenna hoisting" apparatus (homebrewed) up on the side of my house. It's a TV wall mount bracket and a bit of a homebrew hardware store hoist. I regret not going with a sturdier single piece of vertical pipe. As it is, I have a bit of a "There I Fixed It" quality of homebrew. If it fails, it's going to just gently fold in half on me, I hope. I have wire guys on there that can hold the weight, so I'm pretty sure this won't fall on anyone's head. If it stays up for a few weeks, that will be all this arrangement lasts. I think I'll replace the flimsy metal 0.5" conduit with something that is stronger. Perhaps some fibreglass pole. In the photo here there is no G5RV yet. Just this pole, and some rope, and a pulley, for hoisting things weighing up to 10 pounds, up to 8 feet above the peak of my roof without climbing up on it. Once the weight is on this flimsy pole, I will adjust and re-true the guy wires, and hopefully it lasts for long enough for me to have some fun before I obtain a better mast. Update: One week later, the bottom half had bent almost 15 degrees and the whole thing looked like a downrigger. After I tried to straighten it up with the guy wires I managed to get it bent into a C shape. Then I took it down. I also managed to bend the brackets a bit while trying to un-bend the cheap conduit. Lesson learned? 0.5" conduit is for putting wires inside of, and bolting to a wall, not for building antenna masts with. Uh, yeah. Shocking, I know. I ordered an RTL-SDR dongle from China about 40 days ago. It finally arrived. I'm listening to the cab companies in Toronto dispatching, around 162 mhz right now. I can hardly believe how amazing this "scanner", 50 mhz to 1.2 ghz AM, FM, SSB receiver works. Next month I'm going to build an HF upconvertor and put it in a tiny tin. That will be fun. I joined the Peel Amateur Radio Club, and they are having a build-it day with RTL-SDR plus HF upconversion board. Can hardly wait! Assembling the download pieces to run it was too hard. I uploaded the set of files I needed on OneDrive here. I went to my first ham-fest today. I bought a mag-mount 2m/70cm dual band mobile antenna that I have already attached to my BaoFeng UV-5R, which came with a completely rubbish -280 dB Attenuation rubber-ducky antenna. I'm only slightly joking, that's probably close to the real figures. I also bought a G5RV. I learned that G5RV is the callsign of the amateur who invented this classic multi-band HF wonder. I began to think on how exactly I plan to put this baby aloft above my QTH. There, look, I'm talking like a ham. I flat out refuse to use the word "destinate" though. That is not a word, hams, so quit using it like it is. I met one of the fellows who wrote the Coax Publications study guide that I used to pass my exam; Geoff, wonderful guy, hooked me up a super deal on a soldering station, only $25. That might have been the best deal I got all day, but here's the thing I'm actually most excited about, you may think I'm silly. I'll just post a picture. The plan is to make a little Ham Shack call-sign thing with a glowing tube, and everything. 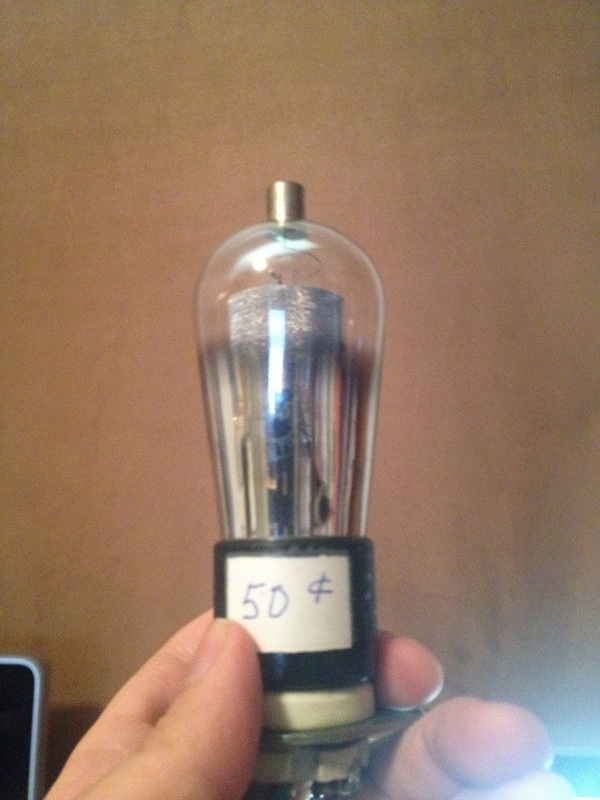 What kills me is this is the only tube I saw for sale cheap that came with the socket. I have a license. I have a radio. I have not made ANY contacts yet. Zero QSOs. Also, I did not have a Log Book. You don't need one, but I didn't want to "make my FIRST EVER QSO" and NOT LOG it. You know? So I bought a log book today. I made two entries, one for getting my license, and one for my first hamfest. My log book is a hobby scrapbook. While I was doing the Aquarium hobby I wish I had kept a hobby log. I signed up for a homebrew "buildathon" day with the Peel Regional club, and I'm very excited about it, it's in April, and we'll be building an HF band SDR based on the RTL-SDR dongle, and an HF upconversion board. I have had an RTL-SDR dongle on order from China for about a year. Okay, 30 days. I am a bit eager to get it, and get playing with SDR receivers. But now that I have a log book, and can make log entries, I plan to start making some QSOs. On 20 meters, using the mobile HF 20m antenna loaned to me by Carl. I feel a bit stupid having this radio for several weeks, and being too scared to just get out there and Do Stuff. But now, I have a log. I can record what I'm doing. Also, today, I fought with my BaoFeng and figured out how to program in repeater frequencies, offsets, and tones. 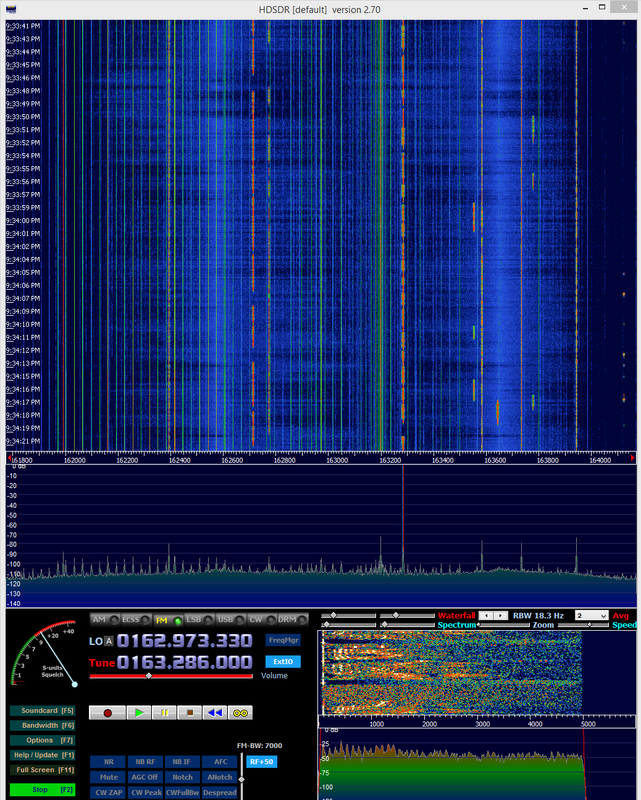 Tones, alias CTCSS, alias several other things. I have no idea if I programmed any of them in properly. I tried transmitting and asking for help with a radio check, but maybe that's not the right procedure, or maybe everybody scatters when they hear some new guy descend on the repeater with their baofeng, and their lack of seasoned-ham Feng Shui. Or maybe I'm just imagining it. It does feel like being the new guy in a high school of 800 people. Tomorrow evening I plan to check in on an FM simplex net, so that should go better than my repeater efforts have. You can't get the radio configuration wrong on a simplex channel. One hopes, anyways. Cheap Logitech PC Speakers make a Great 20 Meter SSB Receiver, at least a point-blank range. I am using a borrowed Kenwood TS-440S, which has 100W power output, when maxed out, but I have been afraid to transmit for fear of blowing up the finals, which are connected to a pretty short mobile antenna. Nevertheless, the antenna is amazingly well matched at 20 meters (but nowhere else) and after making triple sure I had everything set for low power transmission, I went out, and did the "is this frequency in use?" thing, and then called CQ for the first time ever, not expecting anybody to come back, and nobody did. You see, I had the transmitter dialed down to 5 watts. And I'm glad I did, because the cheap logitech speakers in my office were rattling like a guitar-amp turned up to eleven. At five watts. Of course, the transmitting antenna is less than 6 feet away from those speakers, and they have no ferrite chokes anywhere in their design. I believe this is known as audio-rectification. If 5 watts does that, then surely audio rectification is going to occur on my home stereo speakers as well, which will be spooky for anybody else in the house. And, I have a feeling I'm going to get to know my neighbors a little better, if they, like me, all have these cheap logitech speakers on their computers, with about 8 feet of antenna wire, I mean speaker cable, attached to them. Maybe I'll just go on ebay now and order about 100 ferrite clip on chokes from China. When I was a kid, I remember this happening because we lived across the streets from VE3ELN, Ernie Reynolds, growing up in London, Ontario. I thought it was spooky and cool that the console stereo in our living room could have Ernie's duck-like SSB encoded voice coming out our speakers, when the stereo was unplugged from the wall and turned off. Somehow I think the neighbors will be less impressed. My first attempt to check in a 2 meter simplex net did not go well. My only 2 meter radio capability comes from a tiny Baofeng UV-5R which I got from an online seller, shipped directly from China, for about $50. It has a whopping 5 watts output power, going to a small rubber-ducky providing probably -20 dBi gain. The net controller was about 7 kilometers from me and could not hear me. Well, there you go. Disappointing. A better antenna is on a very Slow Boat, that is on its way from China to me, with a better antenna. My main interest is HF, but having 2 meter capability seemed like fun, for $50. I guess there's no such thing as a Free (or Cheap) lunch. Once upon a time there were two young people who wanted to get involved in the Amateur Radio Hobby. We'll call one Fred, and we'll call one Jane. Both wanted to get on the air and be "Hams", and both wanted to self-study because there was no class available to them. Fred just wanted to get on the air. Fred crammed his way through the exam, passed with a score of 81 out of 100, and he gained full HF band operational privileges, and yet if you asked him to explain anything covered in any of the exams, all he could say was, "that isn't on the exam". Fred was not quite sure what his interests in the hobby were, but he had a lot of money, and he bought the best gear, and then set it up. He found the manuals confusing, he found the conversations of other hams unintelligible, and he soon got bored of a hobby that for him, had turned into an exercise in button-mashing, and he soon exited the hobby. Someone got a deal on a high end transceiver a year or two later. Jane, on the other hand, wanted to understand what she was doing. Jane found the study guide she used did not go into enough detail, so Jane went to the library and got out books, and she read and she read. She ordered a small set of electronics parts from eBay, and a breadboard, and learned how resistors and capacitors and transistors work by playing with them. She wanted to understand electromagnetic waves and their behaviour. She wanted to know how a receiver really works, starting out with understanding how the very first working radio receiver worked, and going through the history of the technology, state by state, until we reach the current day. Jane also wrote her exam and got 100 out of 100. If you asked her why the test bothered to make you learn resistor color codes, she would say "Building stuff is fun. How are you going to do that if you don't learn the basics of electronics?". I don't wish to belittle those who have no desire to learn the underlying technology of their hobby. Who among us can really understand all of it? I certainly can't. I am simply using Jane and Fred as "symbols" for two sides of my own personality. One side of me is like Fred; another side is like Jane. When those two sides come into conflict, one has to win. In a frequency modulation transmitter, the _________ is located between the frequency multiplier and the antenna. The part of me that was irked that I had to learn "all that" is a Fred. Expedience: Learn enough to pass the test, restricting my study to the artificial level created by the legal hurdles in front of me. Study to the test, without interest in the physical universe beneath it. Content yourself with the idea that you will come back later and try to understand the concepts later, and decide that not understanding, and not knowing, is better for you. Knowledge is Power: Attempt to understand the physical real world below the concepts and block diagrams, enough that I could use that basis as something to build my enjoyment and understanding of the Amateur Radio hobby on a firm basis. Scientia Potentia Est. My own inner Fred chooses expedience, and my own inner Jane chooses knowledge. I think I will enjoy my hobby pursuits more, in this hobby anyways, if Jane wins out more often than Fred. Still Fred sticks around. As I studied, my inner Fred felt annoyed that I had to memorize resistor color codes, Ohm's Law, and the abstract stages that exist in any real receiver or transmitter design. If you are studying and considering Expedience, ask yourself "How will you suddenly become more motivated when there is no need to do so, to learn something which, if you apply yourself now, may increase your ability to understand and enjoy your chosen hobby, now and long into the future?" If you just decide to be Fred, will you go the rest of your life without trying to plumb the depths of nature, as Jane has decided to do, or will you have a moment of conversion, and become a Jane later? You decide. Your call. This is your hobby. Do what you like, new person who is considering this hobby. Me, I think I'm a little bit of Fred and a little bit of Jane, and there is a bit of a battle on inside my head between them. But it seems to me that the desire to understand things, and the desire to build things, lies at the root of about 90% of what is fun in the Amateur Radio hobby, for me. If it is not the same for you, perhaps you have no inner fred, and no inner Jane, but are an entirely different person. I can easily see how someone who is completely not a "geek" or into the technology could become a very effective radio operator, and have a lot of fun. They could specialize in helping people, in organizing and using the power of the whole community working together, to do amazing things. There are many ways to have fun in this hobby without being Jane, but my point is, that I don't think Fred is going to have much fun, or be much good to anybody. So if you're neither Fred nor Jane, please don't think I'm slamming you if you're not "into" the technology side of this hobby. I respect ANYBODY who wants to get into this hobby, and I don't need to know why you want to. I just want to share what it felt like for me. So given that I wish to understand things, and know things, and thus, be able to do things, I have some suggestions for people like me, who are using the fantastic Study Guide for Canadian amateurs, made by great people who I earnestly respect, at Coax Publications. In my opinion, they did a great job of trying to balance between those who want to learn technology (me) and those who want to pass the test and get on with their chosen interests in the hobby. You can't write one book and make it perfect for every learner, and I certainly know that I'm not the average learner in any way. So for me, and for my learning style, I feel that certain modifications (in my own study practices) are very helpful. If you recognize that you are like me, you might find these help you too. If they don't, don't worry. Where possible I think it is better to draw an antenna that looks like an antenna, and draw a speaker that looks like a speaker. However, what does a mixer or an intermediate frequency amplifier look like? How am I to keep an RFO and a VFO mentally separated? If something is an amplifier or a mixer, I think it is better to learn the symbols used in the field, and use them. Symbols, and glyphs and variables (I for current) have important symbolic power, and are part of the way that your brain (and mine) organizes, understands, and processes abstractions. Now, my job of memorizing the block diagram just got easier. That visual symbol is laid out so that some information goes into this stage (the left side), and goes out of the stage (on the right side) and requires some supporting information (the up arrow from below). The general flow of my block diagrams is always from left to right, and the stages that receive some intermediate form of information that is less processed in the desired manner (receiving a radio wave and turning it into sound, by stages) proceeds towards a more processed state, as I move from left to right. Things which do not have an input and are only outputs, like a local oscillator, are mentally kept separate in my head while I learn, from the things that have both inputs and outputs. Things which I am learning the purpose of must have distinguishing characteristics. If you want to play with radio transmitters and receivers, why are not not learning how they work? I re-committed myself to the idea of understanding what I'm doing, and rejected the mental voice of expedience that I had previously been entertaining subconsciously. Rule 2: I Love Abstractions. I Learn Best when I Collect Them And Understand Them. I initially found myself annoyed at the people who decided that in equations we should use E for the voltage, instead of V. Why was I annoyed? Why was I confused? Why do some presentations of Ohm's law say "V = I * R" and some say "E = I * R". What is the E? It's a little piece of the history of science, dear friend. Don't try to be so modern that you can't understand the past. That's my advice. I started to see that understanding differences in notation and being able to read all of them, meant I was learning notations and abstractions. This is an important part of learning to communicate about technical subjects with other amateurs, and is the beginning of growing your mental capacity to read technical work and try to understand it. Don't give up. There is a reason for separating and understanding the use of the variable (E) the unit (Volts) and the physics concept (Electro Motive Force or EMF). If some people write Ohm's law with a V and some write it with an E, you can probably handle both sides. If you understand what is being expressed, and the history of the various ways of saying things, you will find they start making sense. In the early days they said "Megacycles" and these days it's "Megahertz". If you can understand and follow along, you can read the old articles and the new ones, and glean much from both. Know both. There are old abstractions, perhaps dusty and discarded. Understand their place in history of your technology and your hobby. There are shiny modern forms. Know both. Abstractions like the notion of Current and Voltage are analogues to real physical processes involving the real physical universe, but are abstractions because they represent a simplification of what are, at the bottom level of our current understanding, phenomenon that are results of quantum laws. I suspect, but I do not know for sure, that the quantum laws we now know are but abstractions, which will later be replaced by even lower-level physical observations than those we now observe at the quantum level. I think it is possible that in 300 years people might have some new stuff in the introductory electronics textbooks. Progress marches on. I have some sympathy for history, for explorers, and discoverers. There are two kinds of "Current" flow directions used in basic textbooks about electronics. As a new learner, this kind of complexity may throw you for a loop, discourage you, and confuse you. I know I found it confusing when I first tried to learn some electrical and electronics concepts. I think a sensitive introduction to a subject, for a new learner like me, who is a techie and a history buff, needs a large dose of history. Much has been said about Ben Franklin being "wrong". In some sense, yes, these early pioneers were "wrong". If one posits the electron's existence, and its direction of flow, and then later finds out that reality is otherwise, then, yes, the scientific and sensible thing to do is to say, "you're wrong". The part of my that is by nature a historian, an observer of truth unfolding over time, is that I think it is anachronistic and obscures the truth of history to simply say "they were wrong". They were, precisely, choosing a path because a choice of path was required, and in the absence of evidence to the contrary, chose what seemed a perfectly reasonable notation and convention at the time. Personally, my goal is to understand the value of both the simple literal physical realities we observe, and the abstractions we build on top, and the history of how we got where we are right now. I notice that some text-book writers share my preference, and some do not. I happen to need to know the various bends in the road, the various discoveries, the various controversies, or disagreements, the famous experiments, and the ways by which we learned that which we now proclaim as "fact" to people who can not understand how we got there. So I do not think "conventional" current is wrong. It is a valuable abstraction. History is good to know. We are throwing a wrench in the works if we only state "it was wrong, now fix it", and then try to erase the "wrong" information. Instead, what we need to do is understand the history of "how we got here", and include the now-discarded initial wrong hypothesis in our study, or we will remain confused forever. I suspect that the whole electrical engineering world is on a swing towards the "rewrite everything" and "simplify and erase history" mode, and that in the Amateur Hobby at least, important books like the 2014 ARRL Amateur Radio Handbook have resisted this tendency and are trying to stay the course of traditional engineering discipline and notions. The fact that one should state one's conventions and then stick with them creates an important and useful way of working with complex matters like electricity, electronics, and fundamental physical reality. For example, when we define a capacitor, or an antenna, we can choose to think mentally of a perfect capacitor, or some ideal or abstract source of radio waves. This is useful precisely because we can have one equation model everything we need to model about this not-real capacitor and this not-real antenna. Then we can describe all the real capacitors and antennas and compare them to the real ones, and thus to each other. Abstractions are great. Formulas and rules, and so on, are great. They allow us to organize and understand how the world works, and then provide a baseline for comparison so we can determine the causes (and corrections) of things which do not fit with our abstractions. Rule 3: When your brain is full, stop. The most useful thing I learned during my study was to let myself take a break, and not study any more for two days, or three days, if my brain gets full. When my brain gets full, I get frustrated, I get confused, I can't think straight. My brain isn't capable of absorbing massive amounts of information at all times of the day and the night. That's all I've got for today. If you want to be a Jane, and feel that you have to fight the tendency to be a Fred, you might find my rules helpful. If you don't, feel free to ignore them. This is your hobby. If you know how to get where you want to go, and you know how to have fun, please don't let me tell you want to do. If you have any suggestions or corrections to what I have written, to make it better, more helpful, or more clear, I will entertain any suggested edits and corrections. I especially welcome any corrections for errors of fact, or imprecise or improper descriptions of things. My name is Warren, and I am a Canadian, who recently decided to do a self-study and get my Amateur Radio operator certificate. I don't think I'm allowed to "go on the air" until I get the paper certificate in the mail, but I decided to create this new blog right away. I think I will try to collect information here of interest to novice Canadian Amateur Radio operators like myself, and those who, like myself, could not find an active training class, and might like some help with self study. 1. I got the Canadian Amateur Radio Basic Qualification Study Guidebook from Coax Publications, I read about a chapter a day on the first go through, without taking any notes, or stopping to do exercises. My personal learning style is to gather a survey level introduction. That took me about two weeks. 2. I then went back and read each chapter in a detailed "study" mode. In study mode, I made some notes, particularly I drew diagrams where I felt it would help me visualize things. There are a lot of questions on the test about what component comes before and after components X and Y in an object of type Z, where Z is something like an FM Radio Transmitter, or an FM Radio Receiver, or an SSB Radio Transmitter, or an SSB Radio Receiver. I felt that the diagrams helped a lot. The names of bands, the start and end frequencies, and the bandwidths and modes permitted. Label the various pins on components like diodes, transistors, FETs, and tube triodes, and then not only memorize the question answers, but really try to understand how diodes, transistors, fets, resistors, capacitors, etc, actually work. 4. Because I'm interested in knowing a bit more than the study materials covered, I ordered a few more books online, and got some books out of the library, which I started reading even before I wrote the test, because I wanted to know more than a book like the CARBQSG could cover. I got the ARRL Amateur Radio Handbook from an online book seller. I got some books on fundamental electronics out of the library. 5. When I was confused, some nice hams helped me out. I used some local club message boards, and some email contacts to ask other hams for help. They were fantastic, especially the nice people who published the book I bought. I highly recommend this book, not only because it's a good way to prepare for the test, but also because the folks who published it really care about helping new hams out. 6. I used the practice exams on the Industry Canada site, and the practice exams on the Coax Publications site, but neither one was as handy to me as the practice exam iPhone app "Ham Basic", which I used every day on the way to work while I was on the bus, and every night on the way home. This got me through the "drilling multiple choice questions". Before I wrote the test, I wanted to have read and answered EVERY question in the question bank correctly at least once if not more often than that, and achieved at least a 90 (out of 100) on the practice exams. After I got to that point, I contacted someone from the IC list of accredited examiners, and took the test. The fellow who helped me take my test took time out of his busy day to spend an hour with me, and administer the test. I am very glad I got started and did the self-study method. As soon as my certificate arrives in the mail, I can go on the air. I attended a local Amateur Radio club meeting, and met some other folks who were waiting for their club's new-ham-training classes to start. There is a nice social element to having a class to go to, but if you're eager to get on the air (I know I am), and you don't want to wait until there's a class you can go to, just buy a book and get started. I'd like to say a quick thank-you to Carl, and Geoffrey, and Prem, three wonderful experienced Radio Amateurs who have each in their own way gone out of their way to be helpful and kind to me, and have been instrumental in helping me get started. I think I might have a bit more to say about Carl, as he really has been incredibly kind to me, but I think I'll save that for another post.